Whether legitimate leaks or simple fakes, photos claiming to show the packaging for Apple's anticipated "iPhone 7" series continue to surface, with the latest shot suggesting some "iPhone 7 Plus" models could come bundled with new wireless earbuds dubbed "AirPods" [updated with a clearer picture]. 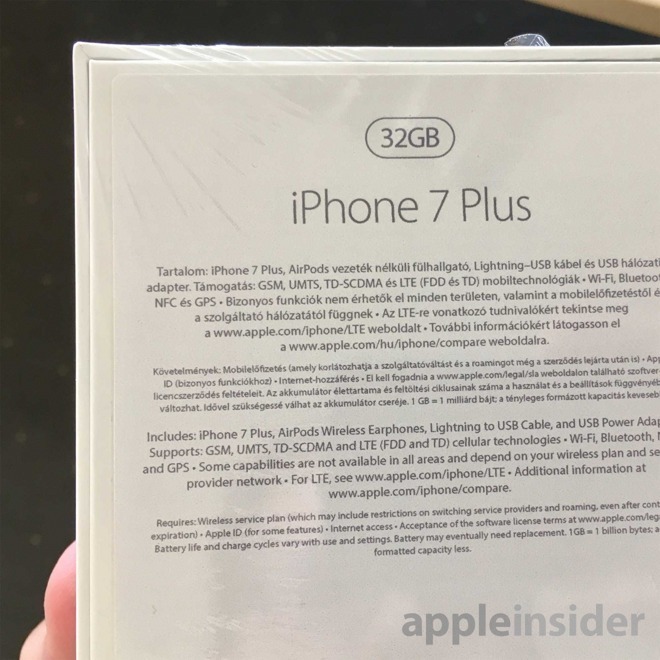 The purported "iPhone 7 Plus" back of box was uploaded anonymously and sent to AppleInsider on Thursday. It shows the details for a 32-gigabyte handset model, but features one key difference from earlier leaks. Under a description of what's inside the box, the packaging claims the purchase is bundled with new "AirPods Wireless Earphones." Earlier leaks instead showed their units including new EarPods with Lightning Connector. 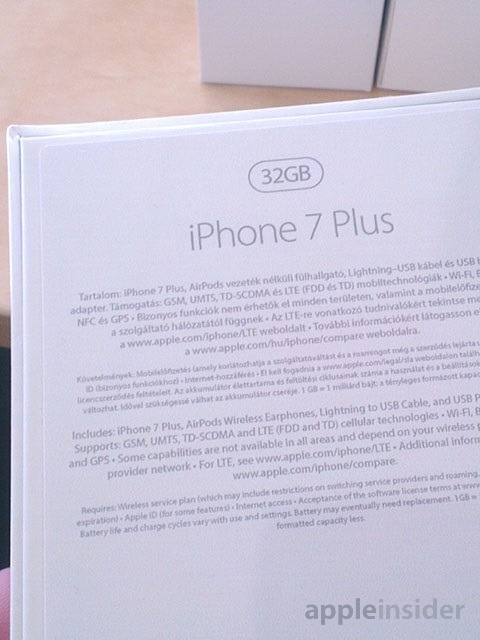 Notably, the earlier photos also made mention of a Lightning to Headphone Jack Adapter being included in the box. But the latest image for a 32-gigabyte "iPhone 7 Plus" with "AirPods" makes no mention of a 3.5-millimeter headphone adapter being bundled. Apple "AirPods" mockup via Twitter user Effah Hanie. The company is rumored to debut a new set of completely wireless earbuds, featuring separate left and right earpieces with no wire between them. The product is believed to be named "AirPods," information known thanks to a regulatory filing that was uncovered earlier this week. It's been reported that the new "AirPods" will feature a proprietary Bluetooth chip developed from Apple's acquisition of Passif Semiconductor in 2013. That company was a specialist in power efficient chipsets. The packaging leaks, if legitimate, suggest Apple might utilize a two-pronged attack to counter backlash against the elimination of the legacy 3.5-millimeter headphone jack. Options for bundled adapters (with Lightning EarPods) or completely wireless earbuds in the "iPhone 7" box could negate many user complaints. And the option of an "iPhone 7" with "AirPods" —and without a Lightning to headphone adapter— would appeal to users who are looking to ditch the wires entirely.